Everyone seems to be blogging about all that happened to them in 2009. 3) Got a baby brother and learned that a nephew/niece is on the way in spring 2010 so this all means even more knitting. Good thing baby stuff is small-ish, right? I was hoping to finish up my Lorelei cardigan before the year ended, but I can’t make it to Hobbycraft for buttons until Jan 2nd. All that’s left to do is the buttons. So I’m still counting that in my sweater tally since the knitting (and seaming!) is all done. I’ve also got a blanket that needs finishing. Three more squares to go. Don’t think I’ll get those done (and seam the darned thing together) before the year ends, but I’ll keep plugging along. As for what’s up for the coming year? 1) More knitting! I’ve got a test knit waiting for me as well as a pair of socks (Bex from Sock Innovation) that I can’t cast on until Jan 1st. 2) Saving money: I want to get a decent amount of savings that I can then use on plane tickets and visa applications etc for our eventual move to Canada. We still haven’t picked where in Canada, but I feel it’s a good thing to be flexible and not set on one particular place. 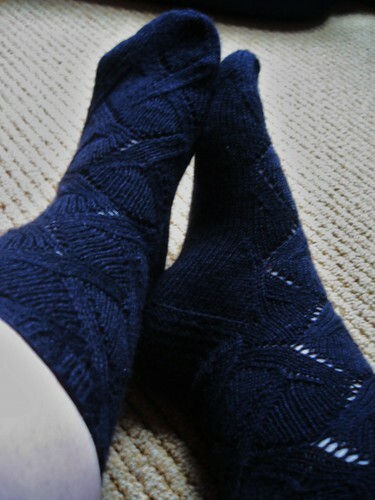 And so I’ll leave you with a pic of my latest FO: A pair of Wanida socks (from Sock Innovation) knit in Darkness (Goth Club shipment from Handarbeitskram by Selana). good luck with the move to canada! Is it me, or did you change your blog layout? This is quite Art Deco — nice but different from what I remember.